Located in the Salem Plateau area of the Ozark Mountains of Southern Missouri, the small shop of Snowbird Banjo Company, LLC sets attop one of the highest points in the state. This idyllic setting provides fodder for inspiration in developing high quality banjos that look, feel, and sound as good as the view from a the top. It’s a quiet place where the sounds of nature are only broken by Jeremy and Brandy Myers’ three children playing. Pursuing his dreams of working in music and woodworking, Jeremy Myers found a home with banjo building in the Ozarks. He build his first banjo in his living room in 2012 and called it the “Ozarks Songbird” (Jeremy’s wife Brandy is an Angel, we all know). However, after an abrupt change in 2014, where Jeremy and his family temporarily relocated to Alaska to try it out, no banjo’s where produced. 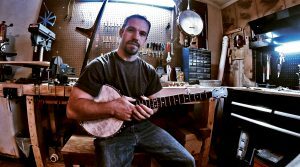 But Jeremy’s love of the Ozarks brought him back in late 2016 and beginning in 2017, work on banjos resumed and the banjo company was renamed and incorporated to avoid confusion with other banjo makers. Work on the shop has been on going and will continue well into 2018, however it is planned that in 2018, regular production of banjos are scheduled to resume. The production schedule is from September to March each year. Originally developed from various banjo styles, Snowbird banjos are simple but can be made as ornate as desired. Featuring primarily an open back design, our Snowbird banjos are a traditional conscious instrument with a modern twist. We are hoping that in the near future, we will start having resonator banjos available as well. Stay tuned for that.